I've seen many restaurants come and go in the space that Hakka Chow currently fills in Winston-Salem. From my recent dining experience, this one will be sticking around. Word of mouth, social media - the rave reviews kept this place on my radar until I was finally able to see what all the fuss was about. Think of it as a Phoenix (popular Asian spot in Greensboro) or even a PF Changs (a favorite chain among many). The menu is extensive, with more dishes that I wanted to try than I could order! The restaurant is dimly lit with Asian-themed decor, and would be a perfect date spot, though I saw several families and business partners enjoying themselves here too. They're re-working the menu to make it a little more concise, and introducing some new dishes. I need to return ASAP in case some of the enticing things I had my eye on disappear! The Singapore Rice Noodles were the best thing we tasted that evening. Chicken, Shrimp and vegetables like Carrots, Bean Sprouts and Scallions are tossed with thin rice noodles and coated with a light Curry sauce. This wasn't overly spicy, and the curry wasn't offensive in the least - it was a fantastic balance. The noodles clung to the curry so that each bite had the right amount of sauce! Kung Pao Shrimp serves a substantial number of plump, lightly battered Shrimp among veggies like Zucchini, Carrots, Peppers and Onion, with Peanuts for a perfect and necessary crunch. The little pepper beside the item on the menu fooled me - it wasn't as hot as I was hoping, but a dash (or 5) of Sriracha got it to the heat level I needed to clear out my sinuses. (I never know if I should trust those little peppers in the menu...how hot are we really talking?) This is a yummy dish, nonetheless! Spicy Asparagus is a very well-satisfying side. Julienned-cut, the al dente veggie is stir-fried with a spicy red chili sauce and garlic. When a dish promises me heat, I expect it. This definitely delivers. They prepare Green Beans the same way. Not in the mood for stir fry? Hakka Chow even offers sushi. I'm telling you, this place has it all! The fish that comes with an order of Nigiri is quite substantial - you definitely get your money's worth. 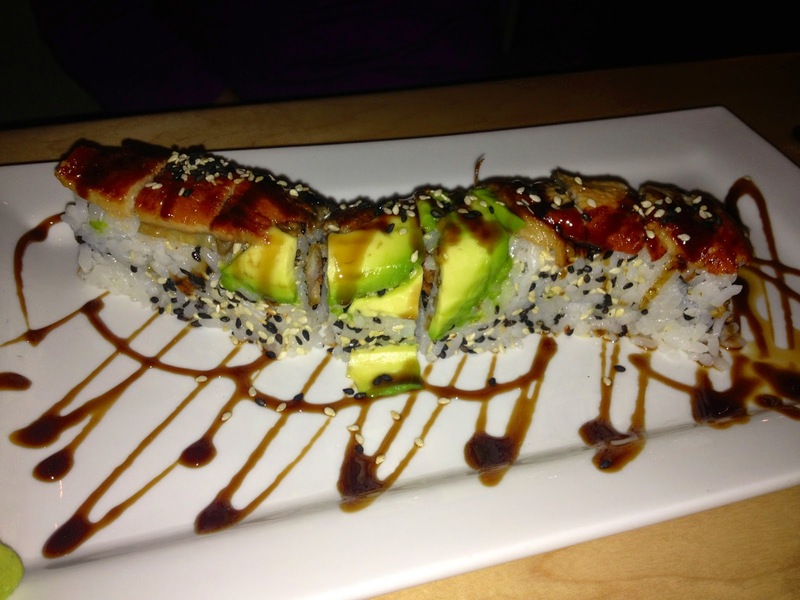 The safe but tasty Winston roll features Shrimp Tempura, Avocado and Cucumber, with a Spicy Mayo and Sweet Eel Sauce. The Crispy Boneless Duck with Sweet and Sour Sauce, and Spicy Sizzle Lamb are screaming my name so hard. The excellent service and tempting menu has me ready to return. I can't wait to go back.